ABBEYFEALE ON LINE! : THE MONK, THE PRINCESS AND THE BLACK AND TAN! THE MONK, THE PRINCESS AND THE BLACK AND TAN! Pope Francis made the headlines worldwide during his visit to Ireland at the weekend and increased the sale of Skoda cars in the process. 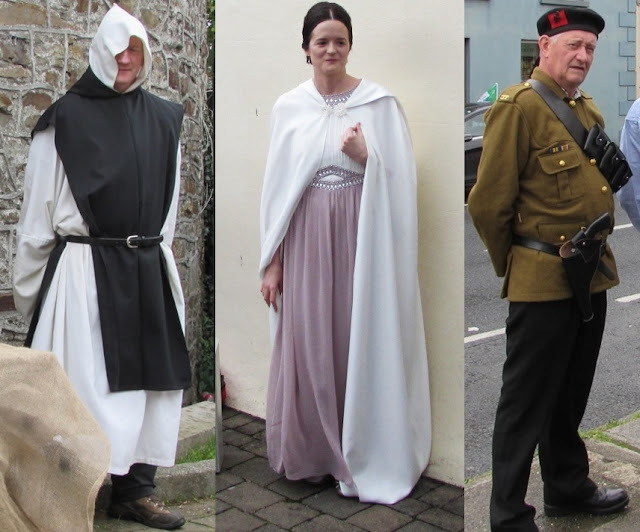 Abbeyfeale Community Council were also in the news as they celebrated National Heritage Week with the re-enactment of some historical events that took place in the town in the distant past. Two young men, Jeremiah Healy and Patrick Hartnett, were murdered in cold blood by a black and tan called Huckerby as they made their way out of town after work at about 7pm on the 20th September 1920. Patrick was a postman and Jeremiah was a blacksmith’s apprentice. Neither of them were involved in any subversive activities. Huckerby watched from the police barracks across the road (later St Ita’s College) as the two youths emerged from Tom Begley's forge and walked out the road. He followed them around the bend and then fired three shots, killing both of them for no apparent reason. A memorial now stands where both men died. Abbeyfeale has its roots in the twelfth century when Brien O’Brien founded a Cistercian abbey in 1188 on the banks of the river Feale, hence the name ‘Abbeyfeale’. The abbey stood within the old graveyard in The Square and would have been built by the monks helped by local tradesmen with timber and quarried stone. They say that wall of the abbey was still visible at the start of the twentieth century. No trace of it remains today but the name still links the abbey and the river Feale – Mainistir na Feile. An Italian Princess, Cristina di Belgiojoso, stayed in Abbeyfeale during a visit to Ireland in 1839. The Princess led an eventful life. She was born in to a wealthy family but lost most of her wealth due to her revolutionary activities on behalf of Italian independence. She stayed at Leahy’s Inn in The Square on the 2nd of October1839 and the written record has survived. It is said that The Princess Cristina gave birth to a daughter, Maria, after returning to Italy following her stay in Abbeyfeale, but there is no suggestion that the two events are in any way linked! Following the re-enactments, renowned folklorist, Niamh Ní Locklainn, gave a very interesting talk on “Bean Feasa” / “Wise Woman” Joan Grogan of Athea in Leen's Hotel. Well done to Abbeyfeale Community Council for taking us all on a trip back through time.